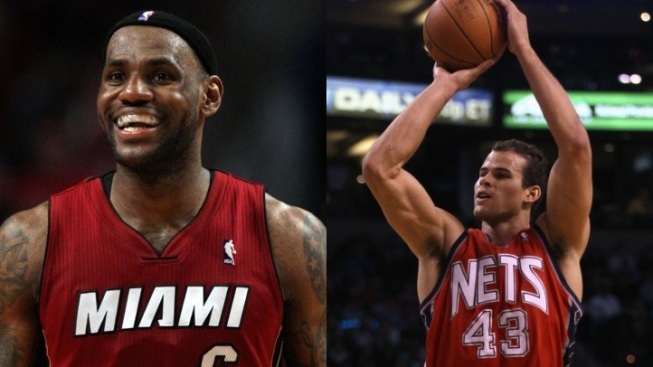 King James loses his black cape to... Kris Humphries?! LeBron was robbed! Sports fans are a notoriously fickle bunch, and apparently all it takes to make them forget about how much they hate the Miami Heat's LeBron James is a high-profile divorce involving Kim Kardashian. Kardashian's ex-husband Kris Humphries is now the most hated player in the NBA, according to Forbes Magazine. A survey conducted by Nielsen and E-Poll Market Research showed that 50 percent of respondents dislike the New Jersey Nets forward, compared to 48 percent who dislike James. James was number 1 on last year's list, according to Forbes, so now we have the answer to an age-old question: Which is worse, breaking the hearts of Rust Belt basketball fans or marrying a celebrity and getting divorced within months? His questionable marriage and quickie divorce from Kardashian notwithstanding, it is still a bit puzzling why so many survey respondents reacted unfavorably towards Humphries. A career 46 percent shooter and mostly role player, he's not exactly the type of player who instills fear in the hearts of opposing fans. The rest of the top ten is rounded out by the usual suspects, like Kobe Bryant (#3), Ron Artest/Metta World Peace (#5), and LeBron's teammates Dwyane Wade and Chris Bosh (#9 and #6, respectively). But perhaps the basketball-watching public is tired of NBAers with TV baggage. San Antonio Spur Tony Parker is the fourth-most hated player in this year's poll, probably because he allegedly cheated on ex-wife Eva Longoria of Desperate Housewives fame. Lamar Odom, married to a Kardashian himself, also appears on the list at number 10. Still, James may wish to use this poll as a little bit of extra motivation heading into basketball season. Some other dude marries a reality TV star and usurps his crown as the most hated man in basketball? LeBron James is the biggest villain in NBA history, no one deserves that title more than him, especially a guy who has started 52 games in his seven-year career. Now is the time for James to remind everyone why he is the rightful owner of the most-hated title, and the best way to do that is by winning an NBA championship.